that might be equivalent to poetry in verse? Rasmus Sievers was born in 1973 in Hannover, where, growing up, he was part of a lively film scene and completed several short films. He was awarded the Filmförderpreis of the German Federal State of Lower Saxony in 2000. Right after civilian service he worked as a cameraman in several TV productions, e.g. for NDR and Deutsche Welle, while at the same time gaining experience as a camera assistant in theatrical films in Berlin. 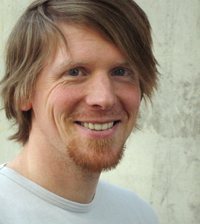 He studied at the film school HFF “Konrad Wolf” Potsdam-Babelsberg from 2002 to 2008, successfully graduating with a degree in cinematography. During these years he spent quite some time abroad, mainly in Barcelona, where he eventually shot his graduation film “Lá Última Calle”. His studies were followed up by numerous film productions, mainly abroad, during which he was able to consolidate not only his professional but also his language skills. 2008 and 2012 he was part of Berlinale Talent Campus, where the documentary “White Lobster” was shown in 2012. Furthermore, he has recently been given the opportunity to pass on his knowledge and experience, e.g. at Merz Akademie in Stuttgart, or at “Filmklasse Deutschland”, which assembles Germany’s promising up-and-coming filmmakers. 35mm, 16mm, and all common SD and HD formats; Raw-Workflows, Color Grading, as well as Greenbox and VFX.